Price: $3.25 MSRP/$1.90 by the box of 20 if you shop around. 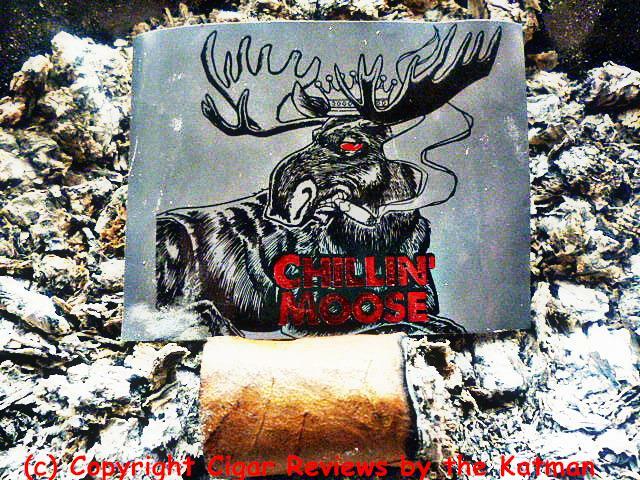 Today we take a look at the Foundry Chillin’ Moose. It comes in three sizes: 5.25 x 42, 6 x 60, and 5.25 x 50. 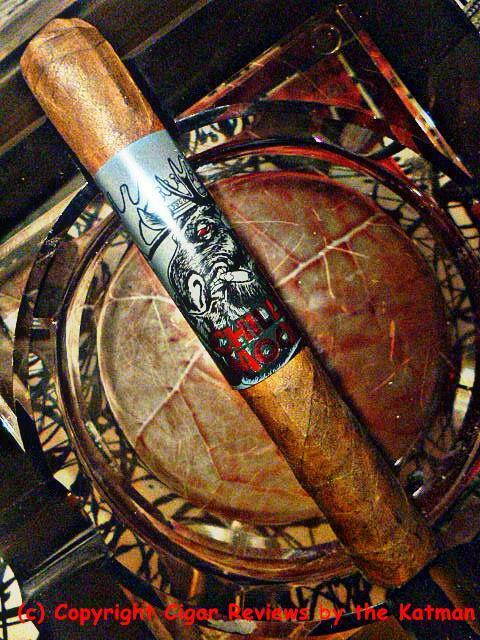 It is Foundry Cigars newest blend. 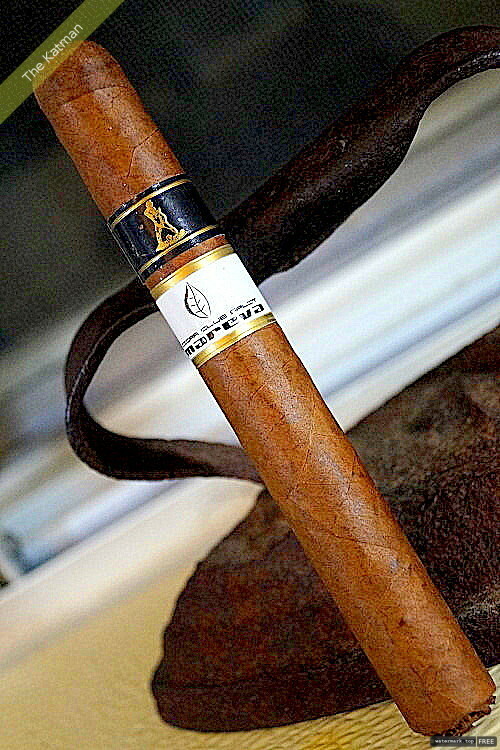 And its first venture into value priced cigars. Oh lord. Every smoker’s dream. A fancy cigar band to cover the fact the cigar stinks. But at least it’s cheap! The whole cigar is sloppy. I shall leave it at that. 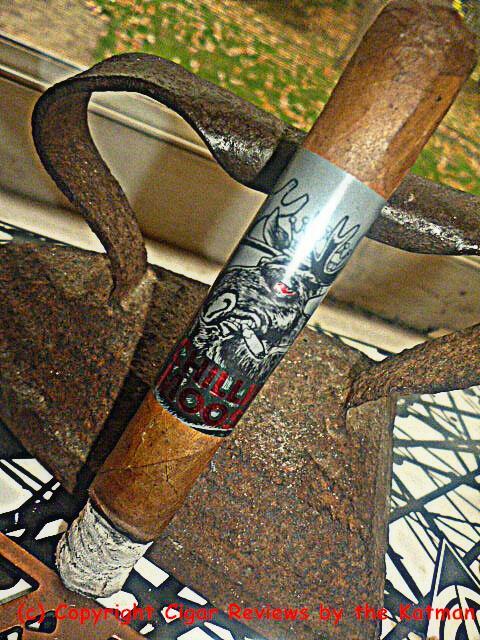 The painted bright red eye on the moose on the cigar band follows you like the eyes of the Mona Lisa. Extraordinary. I clip the cap and find aromas of spice, earthiness, gingerbread, cocoa, and lots of earthiness. The first puffs are full of red pepper. The draw is the slightest bit tight. A little Katman massage should fix that. There is a hard spot, or plug, just below the cap down about 1”. I use my cigar awl and we are hunky dory. The flavor profile is mild/medium bodied and very earthy and very spicy. Beyond that, nothin’. There is a tiny bit of nuttiness, sweetness, a little toasty, and a funky mineral taste. That mineral flavor begins to overwhelm the other flavors. And then a swath of creaminess swoops in like a sea of swarming simbas and secures the area and sends the mineral taste away. The char line goes wavy on me. It started out so nicely with a razor sharp burn line and then goes funky broadway on me. Here are the flavors: Creaminess, spice, earthiness, nuttiness, toasty, cedar, and leather. Must remove the 2” long cigar band. Now I get to see the cigar…lumpy and bumpy and lots of veins. The second third begins. Flavors improve. The sweetness has a fruitiness I can’t quite get a hold of. It’s a little bit melon, a little bit raisin, and a little bit country. I hate to admit it when I’m wrong but the flavor profile is developing nicely into something palatable. That first third would normally be enough for me to put the cigar down. If I weren’t reviewing it, I never would have gotten this far. Surprisingly, the cigar is improving. It will not become a flavor bomb. And I doubt any complexity will be involved. But it is a pleasant cigar with a simple flavor profile. 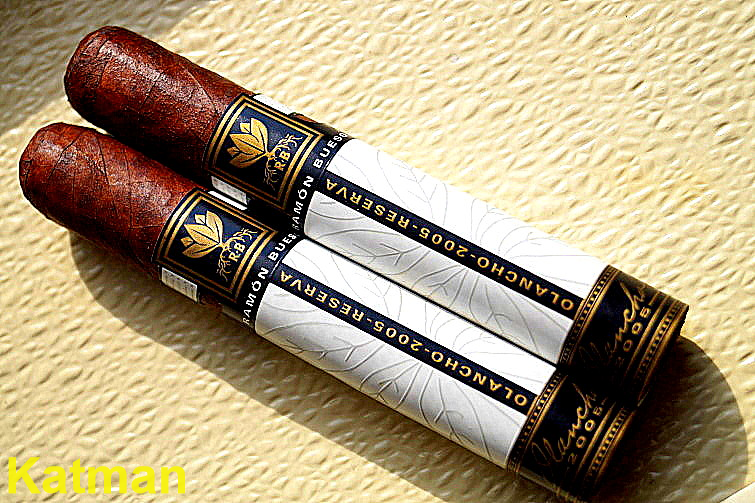 A knock around cigar that if you lose won’t bother you too much. A nice caramel element complements the creaminess. The chocolate flavor becomes stronger. The mineral taste is now completely gone. And so is the spiciness. I am at the halfway point. The strength moves from mild/medium to medium body. A new flavor appears suddenly. I’m smacking my lips trying to figure it out. Could be sweet cedar. Or something very sugary with a woody overtone. I have it. It is chocolate licorice with a big dose of mocha latte. Back in the day, before every candy shop had a multitude of different flavored licorice, I would always go to the candy store at Knott’s Berry Farm and buy some. It was my favorite; even over my love of black licorice. The char line goes back to razor sharp. With the giant billboard cigar band gone, I can get a real look at the stick. It’s not as bad as I originally thought. 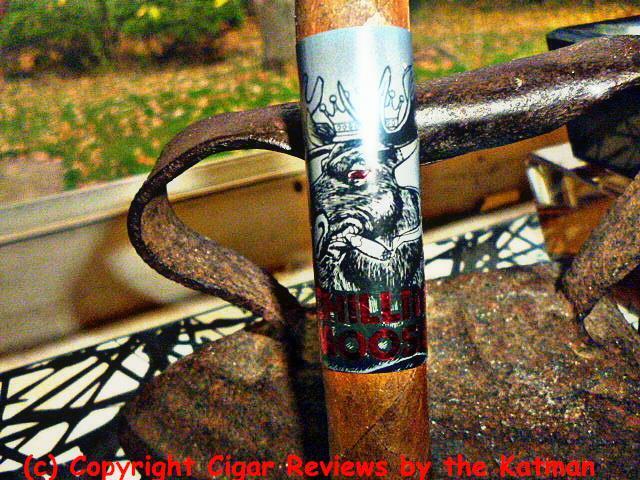 It is a sandy color with a dash of tooth and fairly clean of veins at this point in the cigar. 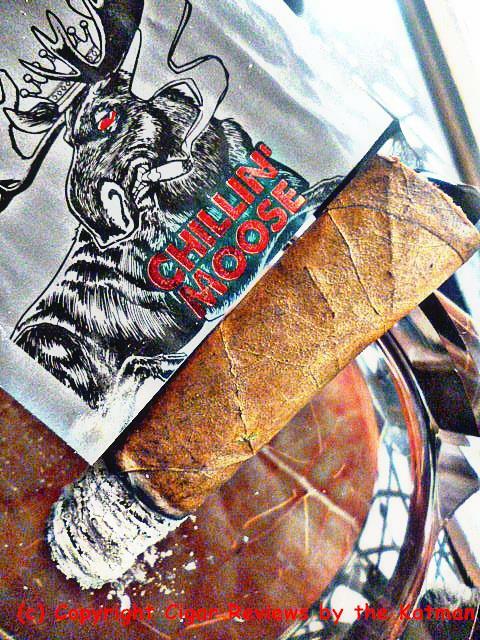 The Foundry Chillin’ Moose is not a bad cigar for the dough. In fact, it is quite the deal as long as you know what to expect. 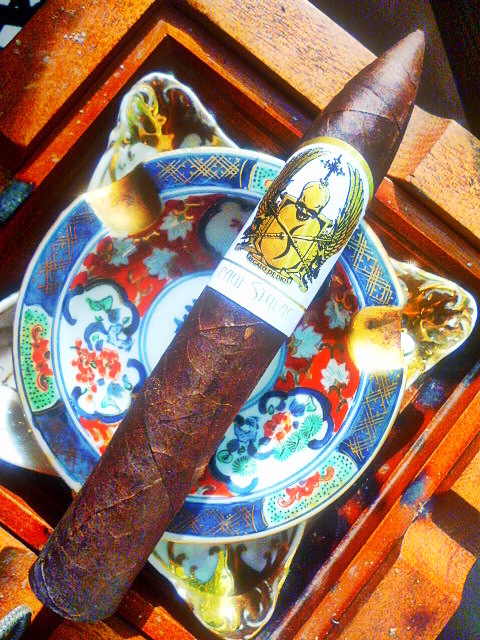 A nicely flavored cigar without complexity or much balance. It does have a pleasant finish. 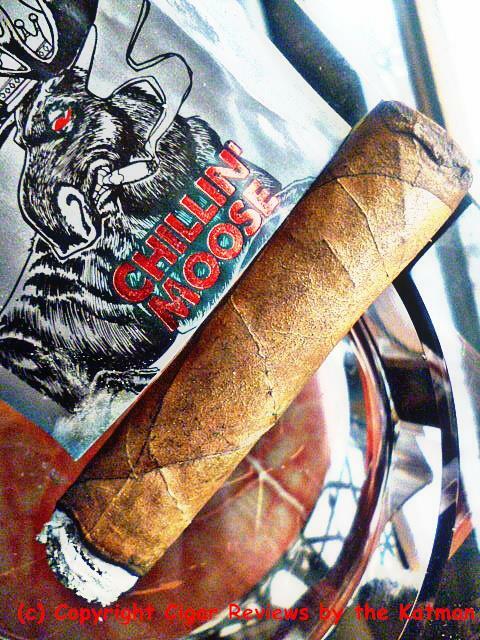 The flavor profile of the Foundry Chillin’ Moose is impressive. 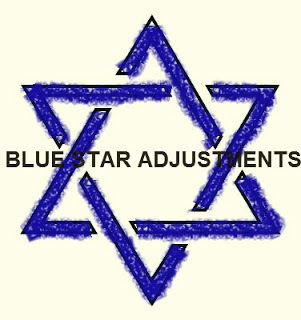 It is constant change mode. 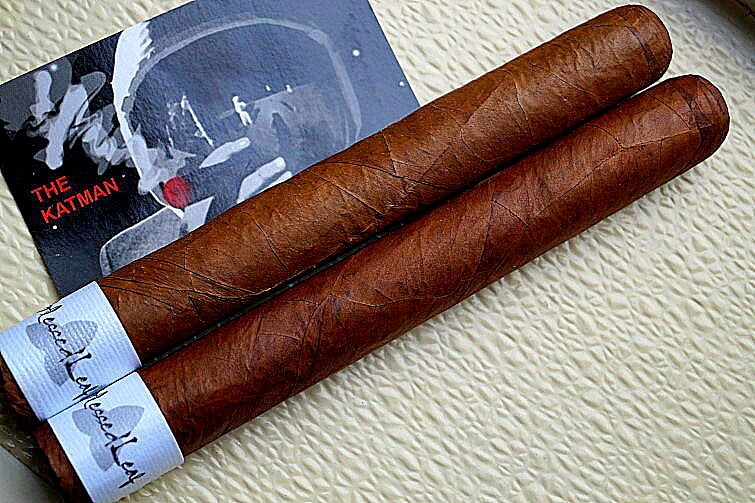 Each inch of the cigar provides a new flavor profile different than the last inch. So my snobbishness has been on display. But only due to my experience with $2 cigars. I’ve never smoked a $2 stick that is this flavorful. I want to thank Rene Cardona for turning me on with a couple samples. With less than 2” to go, the flavor profile has reached its zenith. 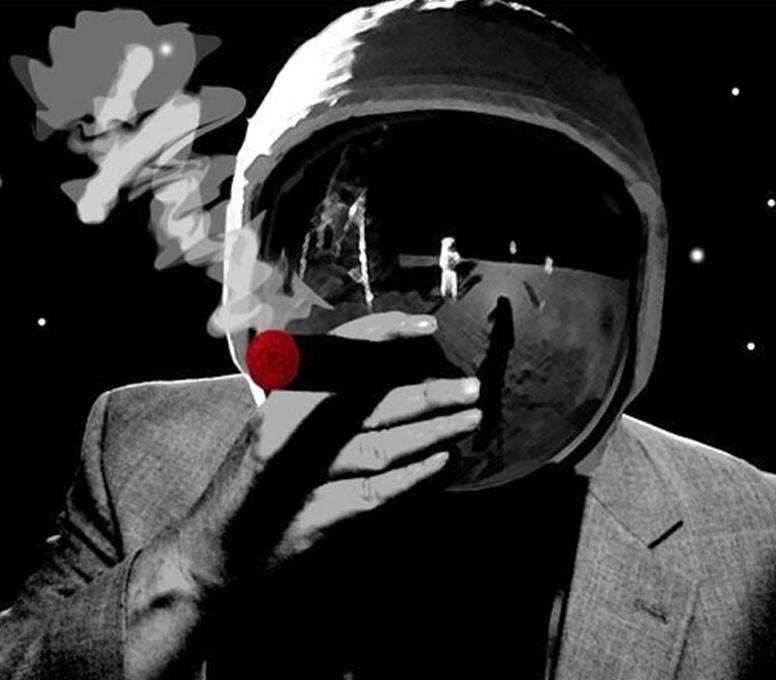 And nicotine shows itself for the first time. 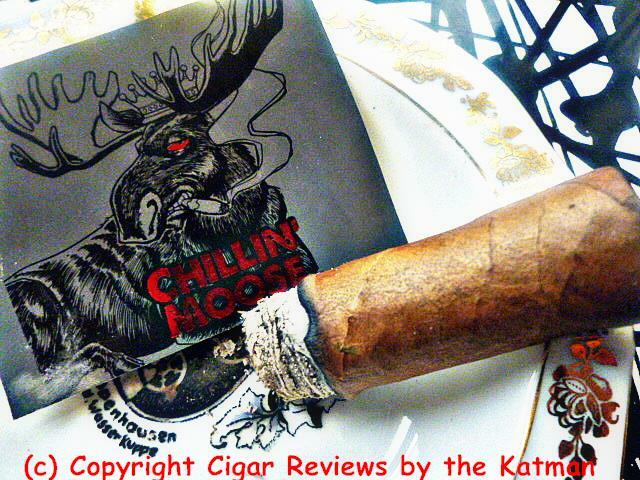 In spite of my arrogance about inexpensive cigars, the Foundry Chillin’ Moose is a cigar I can recommend. It won me over with the interesting flavor profile that occurred after the first third. And you can’t beat the price. 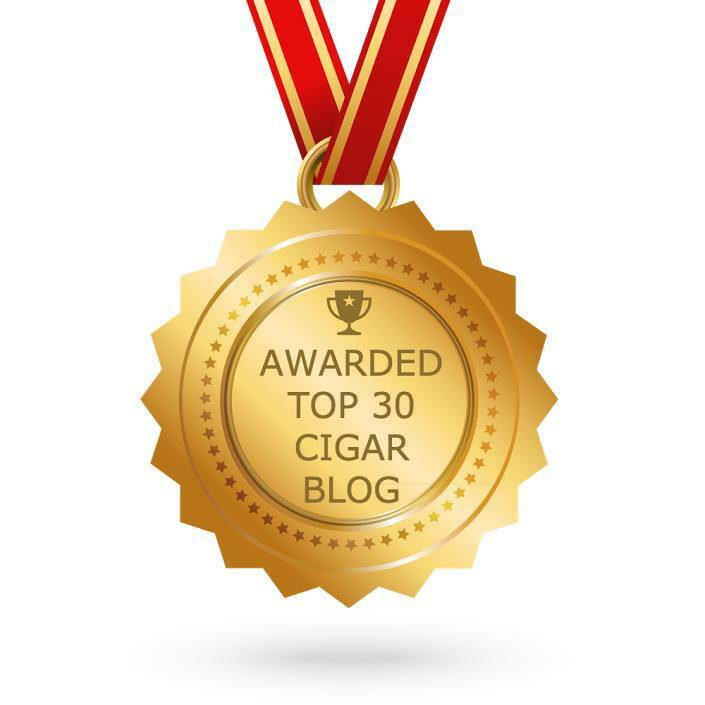 The Foundry web site is relatively devoid of any info but I am guessing it is a regular production cigar. Since it is new, it might be difficult to find, but that will pass. Wally, I found you a cigar. Nice review! One would expect a yard gar at that price. Thanks for the tip on a good value stick. And thanks Rene for bringing this to Uncle’s attention. 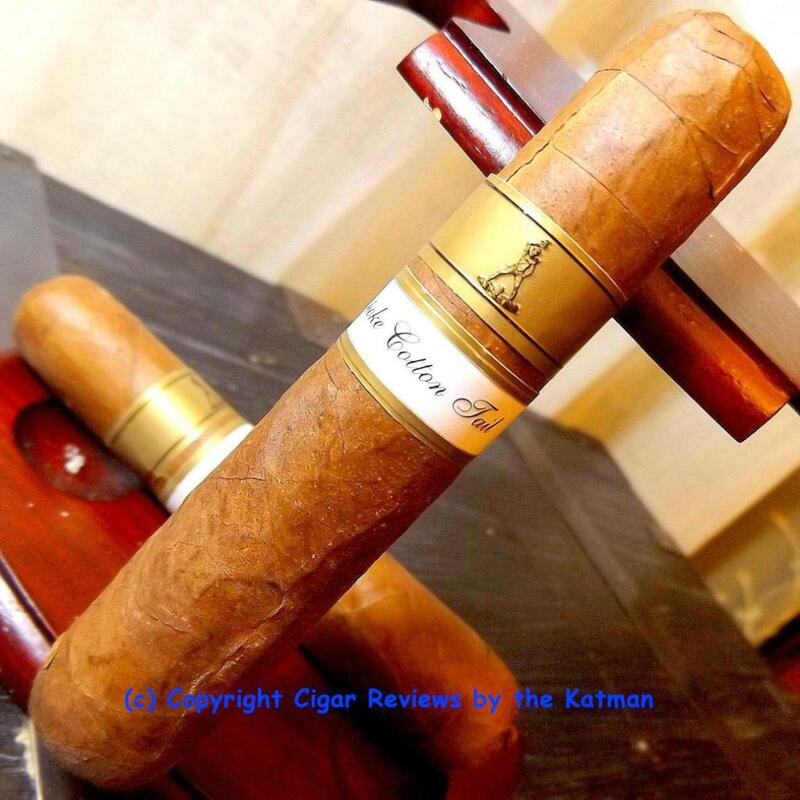 nice review katman, this here is a gem, especially for the money!! in my daily rotation as we speak! !